First Montrose Commons was one of several upscale neighborhoods developed in Houston between 1900 and 1925. The historic district consists of two distinct subdivisions. Over time, these areas have formed a singular identity within the city. Many of the historic houses in First Montrose were built in the Craftsman, Colonial Revival, and Prairie styles and feature stucco exteriors with exuberant detailing and multi-pane windows. However, the neighborhood contains an eclectic mix of architecture. Several historic apartment buildings are also located in the district. The City of Houston was founded in 1836 and quickly became an important trade and shipping center. People made their fortunes in lumber, cotton, and cattle. Houston’s many bayous were used for shipping and the city was also a major railroad center. After the Civil War, city leaders invested in widening the bayous. They also led a campaign to create the Houston Ship Channel and Houston’s deep-water port opened in 1914. By 1930, Houston was the largest city in Texas, by population. Houston’s economic growth created a tremendous need for housing. In the late 1800s, the city began to expand to the north. After 1900, upscale “suburban” neighborhoods developed southwest of downtown. These included Audubon Place, Courtlandt Place, Avondale, Montrose, and Westmoreland. Two other affluent subdivisions in this area were the Bute Addition and the Lockhart, Connor & Barziza Addition. Those subdivisions were right next to each other. One of the contributing factors to the popularity of the development of these two subdivisions was the available access to transportation. The Montrose Streetcar line ran to the intersection of Roseland and West Main from 1912 until streetcar service ended in 1937. The Lockhart, Connor & Barziza Addition was originally platted in 1873 and contained 25 blocks with a total of 256 lots. The subdivision was named after the real estate partners who developed it: Robert Lockhart, John C. Connor, and Phillippa Barziza. Several years later, the Bute Addition was established in 1907 by James Bute (founder of the Bute Paint Company in 1869). The land was owned by his father-in-law, banker James House. Bute platted the subdivision into blocks and divided each block into four large lots. Each lot sold for $750–$1,000. Deed restrictions were established in 1917. These covenants restricted how fences could be built and required that houses should be set well back from the street. In addition, no businesses could operate inside the neighborhood. Today, these two subdivisions together are known as the First Montrose Commons neighborhood. When it was built, the neighborhood was made up of mostly single-family homes. It contains a variety of architectural styles that were popular during the early 1900s. The most common styles in this district are Craftsman, Prairie, and Colonial Revival. First Montrose Commons also contains apartment buildings that were built between 1920 and 1940. These were constructed in the Art Deco, Colonial Revival, Renaissance Revival, Neoclassical, Tudor Revival, and Spanish Colonial Revival styles. After World War II, the neighborhood began to decline. Many single-family homes were replaced by two-story apartment buildings, in an attempt to ease a nationwide housing shortage of that period. The most dramatic change came when US 59 Spur 527 was built in the early 1960s. More than half of the Bute Addition was demolished to make way for the highway. Only three of the original quarter-block mansions survived. More recently, the neighborhood has faced redevelopment pressure from the construction of new two-story and three-story townhouses. Things began to turn around for the neighborhood in the 1970s. In the 1990s, a group of residents organized to work for revitalization. 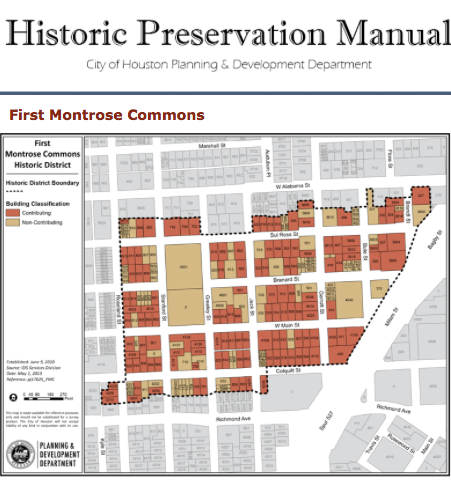 They chose the name “First Montrose Commons” because the historic homes in the neighborhood were among the first built in the greater Montrose area. The First Montrose Commons Civic Association is very active today. © 2013 copyright. City of Houston. All Rights Reserved.